Expand your realm until the whole kingdom is united! 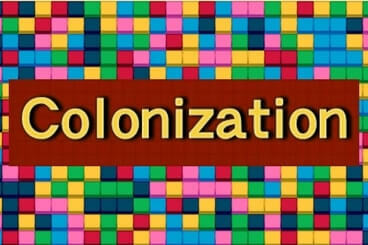 In Colonization, your target is to transform the colors of the blocks so that all of them are of the same color. When the game starts, you will be given a large grid which contains numerous color blocks, and the one marked with a flag is your home block. When you click any of the blocks, the color of the tiles connected to your home block will be turned to the color of the block you clicked, for example, when you click a blue tile, all blocks connected to your home block will be turned blue. Continue the process until the blocks are of the same color. The number of moves you have made will be recorded at the top left corner of the grid. Accomplish your goal with as few moves as possible to become the greatest conqueror! To play Colonization game click any block on the grid, and the color of all blocks connected to your home will be turned into the color of the selected block. You challenge is to Unite the color of the blocks.